Concierge–a man for everything, is an irreplaceable position in all big hotels, resorts, and apartment complexes. 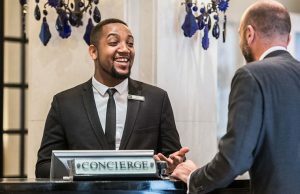 Making reservations for patrons, buying tickets for them, or just recommending them the club to spend the night at, concierges do everything to make the guests feeling comfortable, and cared for. But how can you get this interesting job in an interview? And what will the hotel/building hiring managers ask? We will try to find the answers in this article. Why do you want to work as a concierge? Imagine that a guest complained about your service. What would you do? Imagine that one of the guests wanted to start a relationship with you (were flirting with you). What would you do? How do you feel about sharing tips with your colleagues? Do you listen carefully to their words? Do you talk to the point? Is it a pleasure to talk to you? Do you keep eye contact with them? They observe all of that, and more, while interviewing you for a job of a concierge. They observe it because unless you demonstrate your listening skills and friendly non-verbal communication in an interview, they will never hire you for this job. This is even more important than your answers to their questions. Keep it on your mind. A certain aura of humility, and submission, will also help you greatly in this interview. Becasue that’s what the (often spoiled) guests of luxury hotels and resorts expect from the concierges–to humbly serve them. Nothing bad about it in my book, especially if they throw in a hundred dollar tip at the end of their stay :). The exact questions will differ from one place to another, but we can at least speak about some trends, and topics of conversation. Most of the time the hiring managers will ask about your experience with customer service, your motivation and goals, and they will also outline a few scenarios from the job, wondering how you’d act in them. All of this helps them to understand your attitude to work, and whether you have the right personality for this position. Let’s have a look at some questions. This job doesn’t belong to the high paying jobs, and it is not an easy one. Still, you can find a lot of good things about it. In your interview answer, however, you should refer mostly to things that interest the employer–your readiness for the job, skills that make from you a good applicant, your motivation. For example, you can say that you are very good with people, that you can read their wishes before they even have the time to express them, and have a good understanding for the target group of hotel/resort guests. You can also say that you enjoy doing what concierges usually do, and consider this position a great start for your career in hotel industry. Most importantly, try to speak with enthusiasm. The hiring managers should get the feeling that you actually want the job, and did not apply only because you need any kind of job. Pre-interview research will help you a lot in this case. Try to show something that resonates with you, try to praise the hiring managers. You can say that you really like the facilities in the hotel, or the overall atmosphere in the place. You can also praise their values and goals, the way employees approach guests, or perhaps the spa in the hotel, or any other interesting service they offer to their guests. Last but not least, you can point out their great location (both for you and for the guests) or a recommendation you got from one of your friends. I know two types of concierges. The first type are people who hang around the reception, waiting for the gusts to approach them and ask them to do something. The second type are people who actively look for things they can do for the guests, who will even give them suggestions, or at least regularly ask them if they need help with something (tickets, reservation, transport, etc). It should not come as a surprise that hiring managers try to hire the second type of employees. And you should give them a good enough reason to believe that you belong to the second group. How can you do it? Say that you plan to proactively talk to guests, to offer advice, to always be there to help them. As I said before, concierge does not belong to the easiest jobs, and you typically won’t earn more than $15 per hour (tips excluded). Nevertheless, there are many things that can motivate you to do this job well. For example, you can say that you enjoy being around wealthy people, that you believe their company will have a positive effect on you, that you will learn a lot just from talking with them and listening to what they have to say. Or you can say that helping others to enjoy their stay in any place helps you to feel good, that you naturally enjoy doing good things and helping people, and therefor you won’t struggle with motivation. You can also say that you love to be a part of a team (and there is always a team of people working together in a hotel), and that you do not want to let your colleagues down, and therefor you’ll do the most for every guest. This happens even to the very best concierges. Many guests are spoiled, and some will complain for no real reason. Tell the interviewers that you would stay courteous, and apologize to the guest (even when you did not do anything wrong). This is just the policy, this is how it works in the hotels. Say that you would try your best to remedy the situation, and if you did not remedy it, you’d consult the manager or one of your colleagues for help. This is another tricky question. The last thing you want to do is to upset the guest. On the other hand, relationships between concierges and guests are strongly forbidden in all hotels (though they do happen in secrecy). Tell the interviewers that you would reject their proposal, in a most polite way. A good thing is to say that you have a husband or wife (even if you don’t), and say that it is a reason why you can’t accept their invitation for a drink (or any other invitation). Trying to encourage the team spirit and cooperation, many hotels apply a policy of sharing tips. Tips are collected in a box at a reception, and at the end of the day (or sometimes at the end of the week) all employees from the shift share them equally. If they give you a question about sharing tips, the chances are high that they apply similar policy in the hotel. Tell them that you understand the importance of each staff member, that you know that every great hotel is a team effort, and do not have problems with sharing tips. What are your weaknesses? Do they interfere with your ability to become a great concierge? What aspects of this job do you dislike? Describe a conflict you had with your colleague. How did you solve it? How do you feel about working at night? Interview for a job of a concierge does not belong to difficult interviews. On the other hand, your non-verbal communication, and the demonstration of your listening skills (or of lack of them) play an important role, and you should not underestimate it in your interview. Prepare for the questions from our article, and set your mind the right way before your interview. Show them that you have what it takes to become a great concierge. Leave them no other option than to hire you! And if you are not sure how to answer some of the questions, and would like to see great sample answers to them, have a look at our Interview Success Package. It will be impossible to fail once you have it.